New regulations now require companies to address this issue, and Calgon Carbon can help you mitigate these concerns with our diverse array of activated carbon products specifically designed to capture mercury emissions. 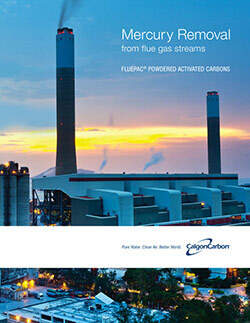 Calgon Carbon is an industry leader in developing activated carbon products for mercury control in flue gas applications. Calgon Carbon has 20 years of experience in the removal of mercury from flue gas, and we have supplied FLUEPAC® powdered activated carbon (PAC) to coal-fired utilities for over six years. We have invested over 12 million dollars in research and development of the Fluepac product line. Thanks to these efforts, Calgon Carbon has developed a first generation of advanced carbon products that typically require less than half the usage rate when compared to a standard carbon. More recently, a second and third generation of advanced Fluepac products has allowed further use rate reductions of up to an additional 40%, all while significantly reducing the amount of bromine in the products. Choosing Calgon Carbon’s Fluepac products will reduce injection rates and treatment costs, grant you peace of mind regarding compliance, and ensure your access to the most advanced PACs available today. Our products are plant-tested and proven, and give you the flexibility you need for any plant size, configuration, and coal type to achieve compliance. Our technical staff will work with you to help select the right product and identify other steps that you can take to improve flue gas treatment performance. Specialized powdered activated carbon can be introduced directly into the flue gas to remove harmful compounds before discharge to the air. Consider total value when choosing activated carbon. Look for high quality, high performance and high value. Confidently achieve compliance with FLUEPAC® Advanced Products. Our advanced products are higher performing than our competitor’s standard products and do cost more. Our standard products are market competitive. Using our advanced products will afford you the HIGHEST PERFORMANCE treatment option in mercury removal. Less product is required so feed rates are lower. Less product is required so freight costs are lower. Our Advanced Product Performance Guarantee promises to keep you in compliance. Better raw materials lead to better results. Low foam index makes for more valuable fly ash.